Iran's Foreign Minister Mohammad Javad Zarif announced he would be stepping down, in a surprise statement posted on his Instagram account. His statement caused a stir both in Iran and abroad. Political scientists and journalists vied to try to explain what prompted him to take this step. The prevailing story is that Zarif was not invited to the meeting between Iranian Supreme Leader Ayatollah Ali Khamenei and President of Syria Bashar al-Assad who arrived in Tehran for the first time after the start of the Syrian crisis. 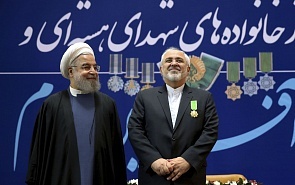 Many experts interpreted the presence of Commander of the Islamic Revolutionary Guard Corps’ elite Quds Force‎ Maj-Gen Qassem Soleimani alongside President Hassan Rouhani as a sign of the reduced role of the Iranian Foreign Ministry in Syrian affairs. After the US withdrawal from the Joint Comprehensive Plan of Action (JCPOA) on Iran’s nuclear programme, the toughening of US sanctions against Tehran, and the sluggishness of the EU and the Euro-troika of the deal participants in developing the promised mechanism for preserving trade and economic dividends from the deal, the right-wing conservative contingent of the Iranian establishment sharply exacerbated its attacks on the Rouhani Government and especially Zarif, Iran’s main architect of the JCPOA. Judging by this, under the circumstances Zarif decided to gauge the willingness of his domestic political opponents to go for a real aggravation of relations with the US and Western Europe up to and including the withdrawal from the nuclear deal, something the Iranian radicals have spoken so loudly about. At the same time, Zarif wanted to remind his compatriots that the Iranian Foreign Ministry must have the opportunity to conduct an active foreign policy. Subsequent developments have fully justified the minister’s expectations. It became clear that Iran’s top leaders are obviously unprepared for the further aggravation of relations with the West. After some confusion, the balance tipped in Zarif’s favor. Many experts recalled his leading role in reaching the nuclear deal that opened the prospect for Iran’s withdrawal from economic and international isolation, which has become tougher not through his fault. They gave him credit for his diplomatic skills, knowledge of the psychological nuances of his US and European partners and his excellent English that allowed him to successfully uphold the interests of the Islamic Republic of Iran at negotiations, international forums and numerous debates with the foreign media. Over 150 deputies of the Iranian Majlis (Parliament), including a number of conservatives, asked Zarif not to resign. Many high-ranking political and public officials have expressed support for Zarif. One of them was Qassem Soleimani who said that Zarif conducts an active foreign policy and enjoys the full support of Iran’s Supreme Leader. Under the circumstances President Rouhani made a justified official statement to the effect that he could not accept Zarif’s resignation because it would run counter to Iran’s interests. Having emphasized the important role of the Iranian Foreign Ministry, Rouhani urged the other government agencies to work in close contact with it. Thus, Zarif managed to receive carte blanche to continue his efforts to alleviate the burden of the US sanctions by pushing the EU and the European participants in the JCPOA to be more active in fulfilling their promises to launch a mechanism for protecting European business from secondary US sanctions.